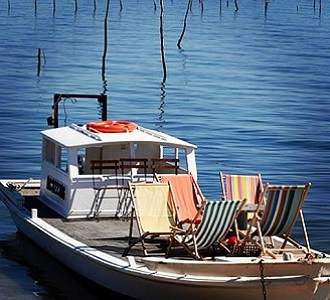 Imagine yourself in a pristine place, facing the sea, with a breath-taking view of the Bay of Arcachon, on a typical oyster farmer boat. 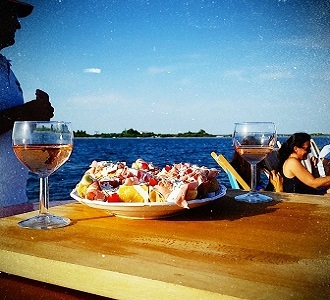 Become a real local during your delicious lunch while tasting Bordeaux wines and fresh local oysters, fresh fish fished earlier in the day, grilled meat in a paradisiac place! This enchanting view and idyllic moment will be etched in your mond forever! You will be able to sight some extraordinary places like "l'île aux oiseaux", le "banc d'Arguin" and the famous oysters farms.